There’s nothing more important than a good night’s rest in order to give your brain the proper time to recuperate so that it can function in classrooms and studies. Be sure to prioritize your bed. Most college dorms are preferable because they already have a bed for you. 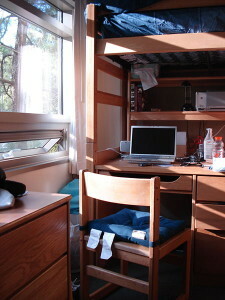 Usually, dorm rooms have a twin sized extra long sized mattress, but it depends on the dorm and the University. Be sure to call in or email the administration handling the dorm and find out the exact dimensions of the mattress before you purchase the bedding. After you get that down pat, purchase a mattress cover and preferably one that protects the mattress from bed bugs. Bedbugs can become a nightmare, and it will affect your studies and your mind state, not to mention the requirement to destroy all of your belongings. In order to save yourself a hassle in the future, as well as costs, get a bedbug protecting mattress cover. Then be sure to get a foam top. Dorm mattresses aren’t always of high quality. A plush foam will go a long way. In addition to this, a mattress pad will keep your nights nice and comfy. To keep you warm and tucked in, get your duvet, cover and comforter set along with your pillows and pillowcases. When purchasing a pillow, get one that has the firmness that you prefer. A bed skirt isn’t necessary, but it will improve the overall look of your bed. If you do purchase a bed skirt, get one that fits the size of the mattress in your room. Also, be sure to hang onto an extra set of sheets. When it comes to laundry day, you’ll have fewer regrets having an extra sheet set on standby just in case you couldn’t get to your laundry on time. Your room is your sacred space. It’s the place to wind down after a day of mingling with peers, professors, and others. Be sure to provide yourself with the ideal space to relax and enjoy your surroundings. For this, you’ll need a bedside table and a lamp, in case you like to read before falling asleep. You’ll need a small rug for the space beside your bed. You’ll need curtains and a curtain rod. Be sure to get measurements of the window in advance so that you don’t purchase the wrong size. Be sure to purchase a bulletin board. Try to purchase a closet organizer that you can hang from the closet rod. These are usually made from polyester and synthetic, so they’re affordable and space efficient. You can store clothes and shoes in these organizers. A clean closet is a clean mind! Now, be sure to get some durable hangers made from plastic or wood. Stay away from wires. They’ll destroy your clothes with creases, stretches, if not snags. You’ll need basics like a trash bin, a floor lamp, and a plush chair like a beanbag chair or a comfy reading chair. For those long hours of reading, your legs will appreciate the plushness for long hours of reading time. Laundry must never go neglected! The bigger the pile, the more intimidating it’ll be for you to tackle. Try to do your laundry at least once a week so that you can manage it. If you don’t know how to do laundry, be sure to get the basics down from either your parents/guardian or online. It’s quite simple as long as you figure out how to separate the darks from the lights, and whether to use cold water or warm water for the wash. Purchase a hamper, a drying rack for delicates that can’t be put in the dryer, laundry detergent, and bleach and fabric softener if you think you’ll be needing these items. Dorm life is usually seen as an equivalent to that of the ramen-eating-life. But keep in mind that ramen has a limited source of nutrition. It’s also high in sodium so make sure you don’t eat it every day! You can get very sick from dehydration. Get some basic pantry items like peanut butter, jelly, coffee, cereal, popcorn, canned goods, granola, dried fruit, and instant foods. These will be good go-to items when you can’t access the food halls during that late night cram sessions. Bottled water is also a good idea, although most campuses have plenty of cold drinks machines. But if you purchase bottled water in bulk, you’ll be saving on the cost of bottled water. Some basic kitchen items to keep at hand include a bottle opener, can opener, dish towels, dish soap, hand soap, plates, bowls, cups, and cutlery. For coffee drinkers, a coffee maker would also go a long way. A basic drip coffee machine will do. If you’re going to have coffee, you’re going to need a mug. Get some plastic wrap and aluminum foil just in case you want to put some food away. A broom, dustpan, and duster will also come in handy. Just because you’re a student doesn’t exempt you from keeping your place tidy! Sweeping up your living space at least once a week will keep your place nice and clean. You’ll need towels! Keep at two large towels at hand, and a couple of smaller towels, too. A pair of flip-flops and a bathrobe will also help if you use a communal shower. Be sure to bring your toiletries in a small basket with space for draining that excess water. If you share a communal shower, these items will come in handy. A laptop is a must. If you take notes in class (if your professor allows you to), a laptop is especially great. If you need a laptop to take to the library or other parts of campus, it’ll be a lifesaver. Have an external hard drive ready to back up all of your stored items. You never know. If you have cloud space, that’s fine, too. Keep several flash drives at hand, too, in case you need it to share files between study partners. Keep several notebooks and folders at hand. Staying organized is a priority to many students. Keep a calendar at your desk so you can write down reminders. Adding them to your phone or tablet device works, too, but these calendar reminders might help you as well. Pens and pencils are also essentials. Keep plenty at hand in case someone borrows one and forgets to return it!